Optimism as a philosophy of life and a sense of commitment to community are traits that can shape young people into future leaders and pave a road to success throughout life. The Passaic Junior Optimist Club was created to allow the youth of Passaic to develop those positive traits, grow through community giving and establish life-long friendships, while finding an alternative to the crime, gangs and drugs that plague our society and prey on young people. The club is open to Passaic High School students grades freshman through senior. The Passaic Junior Optimist Club will forge friendships and serve the community by working hand in hand with our peers to spread optimism through positive interactions. Development of optimism as a philosophy of life. A sense of giving back to the community that carries throughout life – the rewards of doing good for others with no expectation of return. Development of leadership, communications and work skills that will prove helpful in future careers. Fulfillment of high school requirements for community service and development of impressive college application credentials. 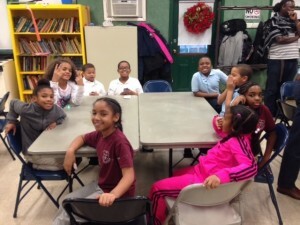 Christmas and Easter celebrations with the Chestnut Kids, the children of the Passaic Housing Authority. Food and clothing drives and grocery bagging outings. Emergency relief fund drives for families who have suffered house or apartment fires. Fundraisers for community and high school causes. Beautification program at Passaic High School. Passaic High School “Thumbs Up” Project to spread positive stories of youth and community. The Passaic Junior Optimist Club has positively impacted the lives of more than 1,000 young people since its inception in 2006. Read some of their stories here. I Promise to: Honor my parents and those whom experience has made wise. Respect the beliefs of others. Value all my friendships and ensure they are true. Treasure and nurture my mind and body. Be diligent and work at each task according to its importance. Strive to be courteous at all times and truthful with everyone I meet. Manage my money wisely and control materialism. Respect all living things and help maintain the balance of life. Work to become independent, always think for myself, set high goals in life and dedicate myself to the service of others.